CSC alumni wishing to participate in the campaign should contact Ken Tate, director of development & external relations at 919-513-4292 or kmtate2@ncsu.edu. 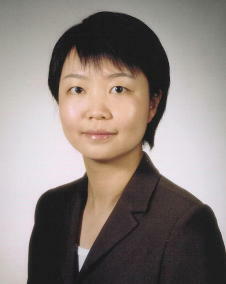 Congratulations to Dr. Xiaosong Ma, assistant professor of computer science, who was recently awarded the prestigious Early Career Primary Investigator Award by the U.S. Department of Energy in support of her research proposal titled "Runtime DataManagement for Data-Intensive Scientific Applications". The award, valued at $300,000, will run from August 15th of this year through August 14, 2008. DOE Early Career Primary Investigator Awards are one of the highest honors given to young university faculty in science and engineering, and are the DOE's equivalent of the NSF's Career Award. Thanks to Fujitsu, ABB, SlickEdit, Field2Base, SchoolDude and Crispin for sponsoring senior design projects this fall. These Corporate Friends, along with Super ePartners SAS Institute, Tekelec, EMC, Cisco and John Deere, have provided us a full slate of 13 sponsored projects this semester. Hewlett-Packard has donated two fully loaded HP Workstations to the department, valued at $10,000. The equipment will be used in the Center for Visualization and Analytics. Corporate Friend, IBM, recently awarded a 2005-06 PhD Fellowship Award to Evan Martin, valued at almost $24,000. Congratulations to Dr. Laurie Williams, whose proposal titled "Academy for Software Engineering Educators & Trainers" has been funded for $10,000 by the National Science Foundation (NSF). The award will run from September 1st of this year through August 31, 2006. Computer Science Strategic Advisory Board member, Gayle Lanier (IE '82), and her husband Dwain (ACC '79), have donated $25,000 to the College of Engineering to fund scholarships. Dwain is director of Fossil Fuels at Progress Energy, and Gayle is vice president of Global Corporate Operations at Nortel Networks. Gayle also serves on the NC State University Board of Visitors and the NC State Engineering Foundation Board of Directors. 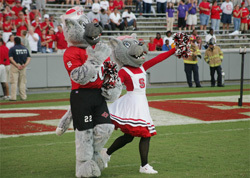 The Laniers are members of NC State's Polk Society, a lifetime giving society. The Triangle Business Journal recently released its 2005 list of the "Best Places to Work" in the Triangle, an honor for local companies for creating truly outstanding work environments. And without surprise, this year's list contains some very familiar names. Congratulations to award winners EMC, Cisco Systems, Network Appliance, and Epic Games, all corporate partners with the department of computer science. Congratulations to CSC alumnus, Robert Allison (BS 1987), for winning DM Review magazine's data visualization dashboard contest. Robert, who works at SAS Institute in Cary, is featured in the September issue of DM Review. A full-size view of his award-winning sales dashboard can be found here. April 28, 2006 - Save the Date! All alumni, students, faculty, staff and friends of the department are encouraged to reserve April 28, 2006 at 3 pm in your calendar for the official dedication ceremony for EBII on Centennial Campus. This will be a very special day in the soon-to-be 40-year history of the department and we hope that you can be with us to celebrate. More details will be forthcoming in the coming months. Females in CSC, take note - On Friday, October 7th, IBM will be hosting 50 Women Engineering/Computer Science Students from local Universities in a Technology "Mini-Day". The session is scheduled to run from 9 a.m. until 1:30 p.m. in the IBM Executive Briefing Center in RTP. A few of the activities planned for the day include a briefing and demo of products by IBM's premiere internship program (Extreme Blue), a presentation from one of their women Distinguished Engineers, facility and lab tours, and a networking lunch and recruiting presentation. Since a portion of the event will be dedicated to a recruiting presentation, participants are encouraged to come with an updated resume. *Home Land Security requires that Chinese Nationals register 3 months in advance of an on-site event. Unfortunately, because of the timing of this event we are unable to accommodate this group. Information Technology entrepreneurs, executives and investors are encouraged to attend the Council for Entrepreneurial Development's InfoTech 2005 to explore critical issues affecting entrepreneurial technology development. InfoTech is also a great place to see demos of North Carolina's hottest new technologies and is packed with current pertinent IT panel topics and expert speakers. This year's event will be held on October 12th at the Sheraton Imperial Hotel & Convention Center. Visit http://www.cednc.org/conferences/infotech/2005/ for program details, registration and sponsorship information. We proudly recognize the CED as one of our valued corporate friends. Congratulations to Dr. Annie Antón, associate professor of computer science, who was recently awarded one of four "Women of Influence" awards at the 2005 Executive Women's Forum in Phoenix, AZ. The awards are sponsored by CSO Magazine, and Dr. Anton will be featured along with the other winners in their December '05 issue. The award is given for the excellent exercise of influence - both within an organization and across the security ecosystem as a whole. Dr. Jaewoo Kang, assistant professor of computer science, who has been selected to represent NC State University in the Microsoft New Faculty Fellowship Award Program. Congratulations to Dr. Kang, and we wish him the best as the competition continues. Alumnus Dr. Frank Wang, now a professor at George Mason University, was featured recently in an article in the New Jersey Star Ledger, on the work he is doing to provide authorities the ability to trace Internet-based phone calls. Wang's PhD advisor at NC State, Dr. Douglas Reeves, is also cited in the article, which details the counterterrorism benefits as well as its potential threat to personal privacy and free speech. Click here to read the article.